A few years ago a man named John Hedditch quit his coding job at Google to follow his dream. He wanted to work in fusion research. This was not a sound financial choice. Fusion is under resourced and it certainly does not pay as well as Google. However, Dr. Hedditch had a vision that most people in this space share: a green energy future for the human race. John is an Austrian, so he went to work at the University of Sydney under Dr. Joe Khachan. The team worked hard - and on August 2nd 2018, Dr. Hedditch submitted a paper laying out some new ideas on how to model plasma . John Hedditch and his boss Joe Khachan. Hedditch wants to use field theory to model plasma equilibrium. This is stealing an idea that is commonly used in the world of quantum physics. Field theory asks how charged particles behave in a field. This is like modeling a spider web. The charges on the particles create a web of electromagnetic forces – that push and pull on one another. The math used, is based on this concept. It is a complex idea that would be tough to code in a computer. However, Hedditch is just using the math to uncover some new insights about plasmas in places where there is no magnetic field. You might think we have already mastered plasma modelling – but that is wrong. There is a body of evidence that our models consistently fall short of reality. For example, tokamaks experience anomalous transport. This is a catchall term for anytime a plasma leaks out for seemingly no reason. Whenever trapping fails to live up to the classical predictions, anomalous transport is the reason. This one example of a gap between reality and our predictions. One flaw in our plasma models is the concept of the super-particle. One super-particle will represent about 1,000 real ions or electrons. The computer tracks these – because no simulation has been able to track every electron and every ion inside plasma. The use of super particles becomes a problem when you need the plasma to be mostly negative or positive. If you need more (+) ions in there, you might be out of luck. The difference populations can be so small, the computer will never see it. Bottom line: super particles work – until they fail. These are just some examples of flaws with our plasma model. Well, models. This post will present seven ways in which we can model fusion plasma. The fact that there are so many methods, should tip you off that this research is still evolving. This post covers seven ways to model plasma: charged ideal gases, charged single fluid, two charged fluids, gyrokinetic, kinetic, everything and quantum. The post was inspired by a recent paper trying to model plasma using Quantum Field Theory. It opens with short histories of the charged ideal gas model and magnetohydrodynamics. An example from magnetic mirrors is used to show flaws in the MHD model. Next, the two-fluid model is explained based on differences between the ion and the electron. After this, particle-in-cell is covered and how it fits with gyrokinetics and kinetics. Gyrokinetics is shown to simplify ions’ corkscrewing motion. Kinetics is shown as (BIC) blob-in-cell modeling. Quantom and klimontovich (everything) models are covered at the end. Plasma modelling got started after World War II. Back then, all physicists could do was base their approaches off older methods. The first theory applied to plasma was the ideal gas. The first person to apply these concepts was Lyman J Spitzer. In the 1950’s, Spitzer was a professor at Princeton. What he did was relatively simple. He combined the physics of ideal gases, with electrostatics; an out came a model for plasma behavior. The concept of an ideal gas is widely used to estimate how gas behaves. Most people know it as the law (PV=nRT) but few understand there are real assumptions behind it. For example, ideal gases can bounce off one another with no lasting problems (aka: perfectly elastic collisions). Real life is not like that. Spitzer stole these assumptions and modified them to apply to a plasma. But unlike gas a plasma is charged. He added in electrostatics to deal with these charge effects. The Spitzer model treats plasma like an ideal gas, with a charge on it. This plasma model was covered in Spitzers’ 1956 book The Physics of Fully Ionized Gases. Anyone interested in fusion should get a copy. 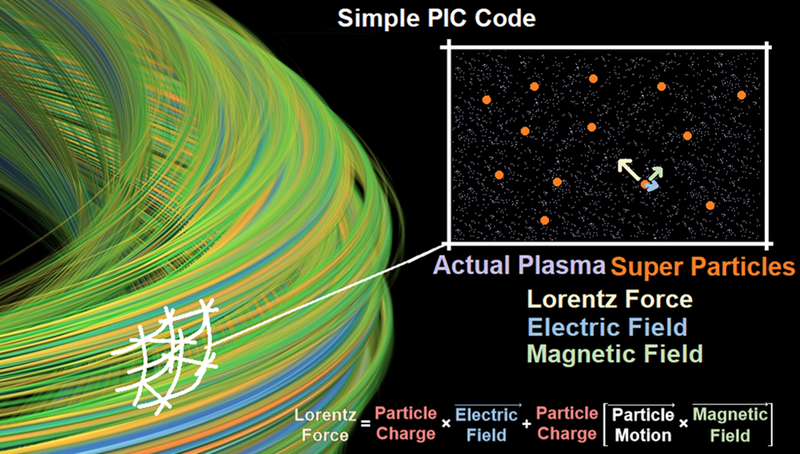 About the same time that Spitzer was developing his models, another approach to modelling plasma was taking shape. When it is dense, bulk plasma can be treated like a fluid that conducts electricity. A conducting fluid. The approach is to combine the math that governs fluids, with the math that governs electromagnetism. This method was taking shape in the fifties and sixties at places like the Courant Institute at NYU. The Navier-Stokes equations are the mathematics used to predict fluids. Correctly formulated, these equations can predict how fast water flushes down a toilet; or the shape water takes as it exits a faucet. The equations are a set of coupled partial differential equations. In many situations, these cannot solve it directly. Today, computational fluid dynamics codes are used to model fluids. Plasma is also charged, are so it conducts electromagnetic forces in much the same way any wire would. The math predicting this is known as Maxwells’ equations. In the 19th century, James Clerk Maxwell outlined the set of equations that modelled how electric and magnetic fields moved through charge material. 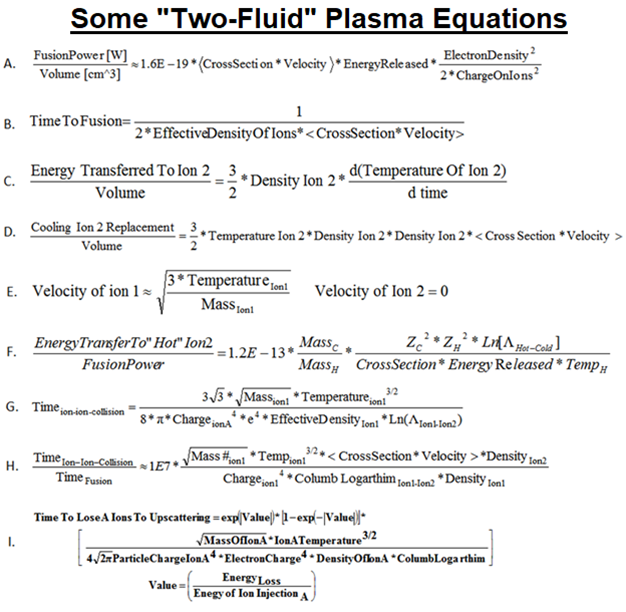 The idea was to combine these two sets of equations to model plasma. This is magnetohydrodynamics. Magnetohydrodynamics treats the plasma like a single, continuous, conducting fluid. The person credited with identify magnetohydrodynamics is Dr. Hannes Alfvén. He was a professor of physics in Sweden. Alfvén published the first paper looking at this in 1942 . His paper pointed out that an electric and magnetic field will force a plasma to move. Over the subsequent years, MHD math was applied across many physics problems. It shows up in: astrophysics, water chemistry and optics. By 1970, the impact was so great that Alfvén won the Nobel Prize for this field. MHD has been used by fusion researchers to help them find tricks to control the plasma; to build a fusion power plant. One example is how to build a stable plasma structure that did not fly apart. A picture of Alfvén and Maxwells’ equations are shown below. But magnetohydrodynamics still has its flaws. For example, you can model a plasma trap like a magnetic mirror using a simple MHD model. Such a mirror is shown below. It is a bunch of magnetic fields lines, bundled together at each end. When plasma moves from lower to higher density fields – it can reflect. This reflection is known as a plasma mirror. The mirror machine was supposed to have two plasma mirrors facing one another. The goal was to have plasma ricochet back and forth until it slammed together in the center and fused. MHD can easily model this system. You can write the boundary conditions. You can solve the equations. The math will tell you that everything will work out fine. Except it doesn’t. In real life, mirrors have problems. The plasma leaks out the ends. Recently, a strong argument has been made that we can still make this idea work for fusion power . But, like so many other fusion technologies, America is failing to invest in this and leaving the door open to other nations. Today, we have no large mirror machine anywhere in the United States. MHD mathematics will not capture the flaws in a mirror machine. On paper, everything will look fine - in reality, there will be problems. This highlights an important concept in plasma modelling. The simpler the math, the more it deviates from real life. This becomes more apparent as we move through other modelling approaches. As you might expect, things have changed significantly since 1956. Back then, physicists could only draw upon models that had existed before. Plasma? Lets’ just pull out the concepts of ideal gases and electrostatics to address it. Today things have changed. New models have evolved to meet specific physics problems. They are evolutions and extensions of Spitzers’ and Alfvéns’ work. Some of these approaches are identified and laid out below. This picture has a lot of information. Five models are presented. At one extreme is magnetohydrodynamics; that method treats plasma like a charged fluid. The MHD approach has very simple mathematics. But, it captures the least amount of real plasma phenomena. At the other extreme is the Klimontovich model . This tracks everything - all the time. That math can be impossible to solve. Along the spectrum, we transition from models that can be solved using pencil and paper, to approaches that require computers. As the transition occurs, the math gets more complicated but the detail increases. Each method has its’ own strengthens and weaknesses. Ideally, you would pick the method that is perfect for the problem at hand. The first method, MHD was already laid out above. The only other pencil and paper approach is the two-fluid model. The two-fluid approach is inspired by the difference between the ion and the electron. This difference is highlighted by this table below [11-14]. An ion is thousands of times bigger and heavier than an electron. If an ion was a marble, an electron would be a speck of dust. This fact drove researchers to consider modelling these plasma populations differently. To basically treat plasma it like two over-lapping fluids. In this approach, the electrons have no mass. This is reasonable when you consider how lightweight a real electron is when compared to an ion. But in this approach, the electrons’ charge, matters. The electron exerts itself, through the electromagnetic force it generates. Therefore when these particles pass one another in a simulation – the EM force is tracked – but the masses can flow right through one another, like ghosts passing each other . The plasma is treated like two overlapping fluids. They only interact through their electric and magnetic fields. This is depicted below. Obviously, a two fluid model will capture more effects than a single fluid model. Hence, MHD does not model as much physics as the two fluid model will. Unfortunately, two-fluid methods take longer to solve. Many multiples of computing time longer . Also - as you might expect – the two-fluid approach does a good job mimicking effects that need high concentrations of one kind of plasma. Like when just the ions bunch together. One example of this is a drift wave. These form inside tokamaks. The ions gather together. They form a swell and wave of plasma with electron clumping together between the ion waves. Drift waves can only happen under certain conditions. They move around ringed systems like stellorators, spherical tokamaks and normal tokamaks. Below is a list of plasma phenomena, compared by which model handles which effects better . The two fluid approach is convenient because its’ math is complex - but solvable. These equations represent about the edge of what can solved using paper and pencil. Any more complexity - and a computer must be used. This solvability is why the plasma physics bible: The NRL Plasma Formulary relies so heavily on the two fluid model. Though it has other information, the two-fluid model make up the core of the reference. Below are a selection of some of these equations. Understand that this method cannot capture everything that happens inside a fusion reactor. The math is not wrong; but it is limited in what it can do. Beyond two-fluid, we move into approaches that are designed to be solved by computers. These methods have more details because they try to track single particles; or the fields they generate. That is why the next three systems evolved from modelling plasma like a charged gas. It is granular in detail. A computer is complex enough to deal this level of detail inside a plasma. It can tracking what individual particles or blobs are doing inside the machine. It does this by fracturing the reactor into small cells. Little volumes, in which particles or blobs move through. Today, this particle/blob in cell method is the most common way we model plasma. These are our workhorse approaches. In the 1960’s, Los Alamos National Labs was the place to be if you wanted to do computing . Workers there had access to supercomputers way before the rest of us. It was no surprise then that Los Alamos was the birthplace of computational modelling. One group, the T3 group, led the way. The team was led by Frank Harlow. Frank and his group developed what is now a common approach to modeling plasma – particles in cells. Today, particle-in-cell (PIC) is a common method for dealing with plasma. If you use it, you owe a debt of gratitude to and his team. Interestingly, the T3 group was ignored and even criticized by their peers . They published when nobody else seemed to care - and they were ultimately vindicated. Below is a visual homage to Franks’ team . Particle in cell fractures the reactor into small cells and tracks the plasma as it moves through these cells. The computer tracks super particles. One super particle might represent 1,000 real ions. The equations controlling the motion of these objects can be simple, or they can be complex. Different models use different mathematics. The simplest PIC codes combine Newtons’ equations of motion with the Lorentz force. Here is how it works. Within each cell, the computer figures out the force acting on that particle. This is based on the local magnetic and electric environment. The fields act on the charged particles - creating a Lorentz force. That force is fed into Newtons’ equations of motion. These are the simple equations that figure out how objects move under any force. Normally when we think about this, we think about big objects like falling apples. But, the same equations work for very small things, like little ion. Once the motion for every particle is calculated – the computer takes a step in time. Everything moves. Now the computer has to re-evaluate everything. It figures out the new forces and then moves everything again. Overtime the motion of the plasma is uncovered. I might add here, that you can do this math, on your own, using excel. This becomes useful when you want to understand how a single ion will move through a fusion reactor. It gives you an intuitive feel for a machine and the electromagnetic environment inside it. It can also answer basic questions, like, will this ion injection beam be trapped by the surrounding magnetic field? Simple excel models have helped me model machines like fusors, the levitating dipole (LDX), magnetic mirrors and experimental fusion reactor approaches. Inside these little cells, the most common motion of a particle is a corkscrewing one. This is because of the nature of the Lorentz force. It is wiley force. It introduces this twisting motion as a new wrinkle in the motion of plasma. For example, if you had an electron sitting still, and you directed a magnetic field towards it, the electron would start to spin. It would spin counterclockwise. Meanwhile the ion would move in the opposite direction. These particles move around the magnetic field, with some radius. While they do so, they are often venting off energy, as light. This motion, and the mathematics governing it, is shown below. In real plasmas, no electron starts by sitting still. No ion does either. Everything is moving. Everything is constantly moving. Material is swirling and mixing. The fields are pulling mass in all kinds of directions. Plasma is flowing into and out of the cloud with some velocity. Inside this melee of motion, a corkscrewing path is the common thing you would see. If an electron or an ion starts with some tangential velcoity, it will corkscrew around the magnetic or electric field. It will corkscrew back and forth these field lines like cars on the highway. Moreover, if the plasma enters a dense field, it can flip directions and corkscrew backwards. Even more amazing, if enough plasma gets together, its’ motion can make its’ own field – and reject the outside field. This is shown below. Gyrokinetics tries to simplify this crazy motion by ignoring the corkscrewing path. While the real ion might move in a twisting path, the simulation models a ring that flies straight. The ring represents the corkscrew. Gyrokinetics tracks this ring as it moves through the different cells of the simulation. This simplification allows the gyrokinetics model to do all the work with only five numbers. These are: X, Y, Z, VTheta and VR. The next model – Kinetics - adds an additional variable. Its’ six numbers are: X, Y, Z, VX, VY and VZ . This will make the kinetic model more comprehensive. Realize: this motion is integrated with particles in cell (PIC) code. Gyrokinetics works and it is simple enough to run on desktop computers – but it runs into problems over long periods of time. As you run the simulation longer, the code will stray further and further from reality. Kinetic theory represents the state-of-the art plasma simulations taking place today. Quantum approaches may be more advanced – but they are just emerging in this field. Kinetic codes are commercially available and can be run on platforms like supercomputers. They have been used pretty regularly since the late 90’s. A leading place for this kind of work is the National Energy Research Scientific Computing Center in California. The image below was generated using a kinetics code. The term kinetic plasma modelling is not strictly defined. Some people consider gyrokinetics just a subset of the bigger kinetic approach. Other people view kinetics as encompassing PIC, BIC and anything in between . They refer to these approaches as: kinetics, fluids and anything that is a hybrid approach. I have decided to separate out these methods because it is easier to explain. What sets kinetics apart is that it models a blob instead of a particle. The code could be called blob-in-cell. A blob is a simulated chunk of the material. This simulated blob has all the gross properties of that collection of plasma. It tracks this blob, as it moves through cells. Whereas before we had representative or super particles, now we have volumes of plasma, blobs, to track. These are little volumes of fluids – like thousands of charged droplets floating inside the reactor. The blob has all the properties of that chunk of plasma. That means it has some distribution of energy. Much like a crowd of people moving through the airport – plasma moves at different speeds. Certain people will be walking, running or on a moving walkway. Certain ions will be speeding, fast and slow. These speeds are tracked using a velocity distribution. The kinetics code tracks the density and velocity distribution inside each blob of plasma. That can be assigned to be some specific curve, like a Maxwellian distribution. But how do these blob move and interact? The code handles this motion in much the same way it deals with the particles. It breaks the calculation into a series of steps. It starts with some arrangement of blobs in cells. For example, a dense blob might be next to small blob. Next, the code figures out the density in each cell. This like an accountant tallying up how many (-) electrons and (+) ions there are in each place. The key amount is the net charge. If there are more electrons, that blob is marked as negative. Following this, the code figures out how this charge is moving. This includes the direction, speed and amount that is leaving each cell. Since all moving charge is a current – this motion creates a current density. The fourth step is solving for the magnetic fields. Each blob creates and reacts to the little fields surrounding it. Based on this - a Lorentz force is calculated. That force, moves the plasma. Finally, the code steps forward in time and everything changes. Material is re-arranged. From there, the cycle repeats itself many times. As this continues, we can capture many of the physical events that happen inside a fusion reactor. Kinetics models are pretty detailed, but even they can miss reality. This prompted a Russian physicist to muse about the idea of modeling everything. The Klimontovich model is a fictitious approach where we would track all the particles, all the time. This does not mean that every particle would have a direct impact on every other particle. Real plasma does not work like this. Plasma has a Debye length. That is the length over which a particle matters to another particle. If it was one millimeter, then particles over a millimeter away have no direct impact on that ions motion. They cannot “see” one another. The Klimontovich approach is fictitious because no code attempts to model a full plasma reactor this way. It would be too complex. In 2018, the most advanced plasma code can do is a complete model of 1 billion (1E12) particles while keeping the total energy of the system constant (1E16 within accuracy) . Quantum methods represent the frontier of plasma modelling. They’re new; like in the last few years. Like all new things – they are not fully understood, appreciated or implemented. Using quantum theory to model plasma is yet another example of plasma physicists stealing ideas from other branches. That said, using quantum mechanics would be much harder to code into a computer program. But the method would allow us a much more granular view of what is going on. There are two places we can steal ideas from in the quantum world: field theory and quantum electrodynamics [2, 10]. This article only deals with field theory. Quantum field theory is the idea that everything exists, moves and reacts inside fields. Typically you think of gravity when you think of field theory. Gravity is a powerful field that we live in here on Earth. The fields inside a fusion reactor are far stronger than gravity. An electric and magnetic field can exert so much more force. Moreover, charged, moving plasma can create its’ own EM fields. These overlap, interact and balance one another, creating a web of forces. Field theory treats all the particles as existing in this web of forces. This is like an invisible spider’s web that connects all the particles. If one ion is moved, it pulls and pushes all the material around it. That field is under tension. It is that tension that QFT models. The math reflects this. It treats each link in the field as a strand under tension. Perturbations can be modelled using this mathematics. That treatment is known as Lagrangian mathematics. These expression contain a rich amount of information: the interactions, tensions and behavior of the field over time. Field theory feels suitable for times when we need the plasma to do something - like make its' own field, or its' own structure. Examples of this are structures like the Field Reversed Configuration or the Spheromak. 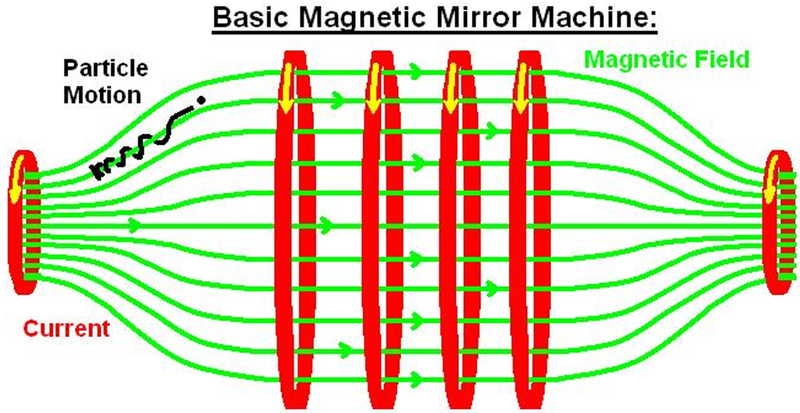 It would be interesting to apply Quantum Field Theory to fusion machines like the magnetic mirror or the levitating dipole. John Hedditch wants to apply this unique mathematics to plasma situations that cannot be modelled with other means. The situation he is interested in is environments where there is no magnetic field. In his paper, he uses field theory to show that such an environment is stable. That conclusion is interest. It lets us model a set of fusion machine where the plasma self-magnetizes. Environments like Lockheeds’ Compact Fusion Reactor, the edges of Tri Alpha’s FRC or the inside of a polywell would all apply. The author would like to thank Dr. Thomas Dolan, Dr. Charles Swanson and Dr. Tomas Linden and others for their assistance with this article. For further reading on quantum modelling of plasma, the reader is referred to Dr. Yuan Shis’ recent defense on applying quantum electrodynamics to plasma modelling . 2. “A different approach to the MHD equilibrium” Hedditch, John August 2nd, 2018, 4 Pages, submitted to Physics of Plasmas, ArXiv <https://arxiv.org/abs/1808.00622>. 3. "Fundamental limitations on plasma fusions systems not in thermodynamic equilibrium" Thesis, Todd Rider, June 1995. 4. Fowler, T.k., et al. “A New Simpler Way to Obtain High Fusion Power Gain in Tandem Mirrors.’” Nuclear Fusion, vol. 58, no. 1, 2017, p. 018002., doi:10.1088/1741-4326/aa8f5e. 5. Spalding, Brian. "New Science: The Development of Computational Fluid Dynamics at Los Alamos National Laboratory." YouTube. YouTube, 11 May 2010. Web. 15 Nov. 2012. <http://www.youtube.com/watch?v=BOpA4Z6xCxY>. 6. Fromm, Jacob. "Numerical Solution of the Problem of Vortex Street Development." Physics of Fluids 6.975 (1963): 975-82. Print. 7. Burby, J. W. “Magnetohydrodynamic Motion of a Two-Fluid Plasma.” Physics of Plasmas, vol. 24, no. 8, 2017, p. 082104., doi:10.1063/1.4994068. 9. "A Comparison between the Two-fluid Plasma Model and Hall-MHD for Captured Physics and Computational Effort" by B. Srinivasan & U. Shumlak, Talk. APS Division of Plasma Physics Conference Dallas, TX November 2008. 10. Plasma Theory Department, Thesis Defense, Yuan Shi, August 15th 2018. 12. Nave, R. "Atomic Radii." Ionization Energy. Georgia State University, n.d. Web. 15 Nov. 2012. <http://hyperphysics.phy-astr.gsu.edu/hbase/chemical/atomrad.html>. 13. Yoon, Jung-Sik, Young-Woo Kim, Deuk-Chul Kwon, Mi-Young Song, Won-Seok Chang, Chang-Geun Kim, Vijay Kumar, and BongJu Lee. "Electron-impact Cross Sections for Deuterated Hydrogen and Deuterium Molecules." Reports on Progress in Physics 73.11 (2010): 116401. Print. 14. Elert, Glenn, Michael P, and Judy Dong. "Diameter of an Atom." Diameter of an Atom. The Physics Factbook, 1996. Web. 04 Nov. 2012. <http://hypertextbook.com/facts/MichaelPhillip.shtml>. 15. "Presentation: Plasma modelling: approaches, limitations, implementations" Tatiana Novikova, LPICM Ecole polytechnique, Lecture, 2015. 16. The Fusion Podcast, “An Interview with Dr. Jaeyoung Park” January 27th 2018, Matt Moynihan.